In my mind, I've been ready for summer for months!! And, now the weather has finally warmed up. Ah. All those cold winter days I spent imagining sitting out on the deck in the sun are over. Now, it's the real thing. Today, I sat out there for a short break and actually got HOT. Wow. Yay! I still haven't changed over my wardrobe from winter to summer. It's past time and I plan to do it right after I write this post. I wish I could have all new clothes every season. Is that what rich people do? Alas, I will pull out the same clothes as last year. I did get a few new things for Mother's Day (thanks hubby), so it's not all old. I'm tired of my winter clothes and I will be happy to pack them away. I noticed on my scale that I collected some unwanted extra pounds. I surely don't want those for the summer. I went on two cleanse days and dropped six pounds. Whew. So, now I can pull out those summer clothes and they will fit just fine. I also got out the sunless tanning lotion. I can't get a tan any other way. And, I like being tan. It's just so easy to put on some lotion and like magic I have a tan. My favorite is Estee Lauder. I've tried them ALL! If you decide to try it, get the "tinted" kind. It's great because you can see it as you put it on and you don't have to worry about getting it uneven. Always wash your hands after you apply. You don't need "tan" palms do you? One of my favorite parts about spring is the daisies. A long time ago I scattered some flower seed in a flower bed in front of my house. The only thing that came up was the daisies. 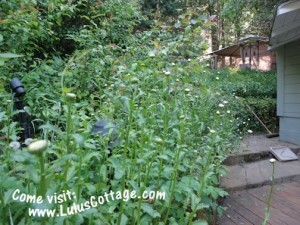 Every year I take the seeds from the flowers and scatter them back in and every year I get more and more daisies. They are a very cheerful flower. I'm a terrible gardener and daisies require no skill to grow. I love fresh air. 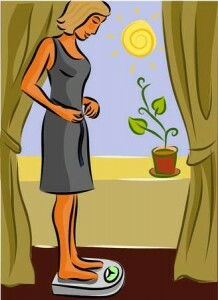 I love to open the windows. I can't get enough of that. I often wonder about big places like Walmart and the grocery store. They never air out the place do they? We already got out the summer furniture, the ping pong table and the BBQ. Things have been so busy, that we haven't had a chance to do much with them, but it's coming. Yes. I"m ready for summer. I look forward to hot summer days, and I still reserve the right to complain about the heat! There is a broken heater by the back door that hubby will take to the dump. I was looking at it and thinking "what a waste". Why don't we fix things anymore? I asked him this question and he said that it would cost more to fix something like that than to buy a new one. I know that's true. But, why? I'm glad that things are affordable. 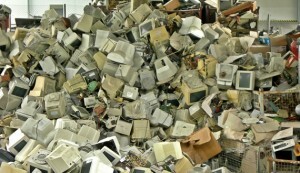 But, it sure seems to me that we throw away a lot of things. My computer monitor stopped working. I will have to get rid of the broken one. Even if I wanted to get it fixed, I wouldn't even know who to call for something like that. And, if I were able to find someone, it would cost more to fix it than to buy a new one. I was trying to think of things that you would repair. Cars. Major appliances? Geez. Are we the throw away society or what? I've had 3 laptops and I still have the first two (that are broken). I don't even know why I am keeping them. If your camera breaks, will you try to get it fixed or buy a new one. Mine is a very inexpensive one, so I'm sure I would have to replace it. If your cellphone stops working, will you try to find someone to repair it or will you replace it? My computer is running really slow lately. That is one thing that still has repair shops. I think I just need a tune up. But the last time I took a computer to the shop, they told me it was dead. Argh. It wasn't always this way. My Mother in Law keeps everything and will find a way to fix it if it breaks. She still had a rotary phone until recently. I don't think that you can even have one of those anymore, for compatibility reasons. I seem to remember there being more "repairmen" when I was a kid. 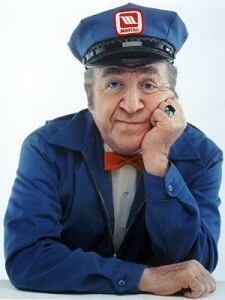 Do you remember the "lonely" repairman commercial for Maytag? So many people are all about recycling and protecting the environment. But, I don't hear a lot about the sheer amount of things that we get rid of. Surely this is filling up some landfill somewhere. What if we started fixing broken things again. What if things were made to last. Was it always like this? I'm talking about politics. I have very strong opinions. But, I don't go about talking about them all that much. Because I am in business for myself, I feel a little less free to share my opinions. I wouldn't want to lose business over my views on the issues. But, I'm not the least bit secretive about it either. I grew up with parents who always voted the Democratic ticket. And, I did the same for many years. At some point, my husband and I both felt that our views didn't match the views of the folks that we were voting for. So, we started opening ourselves to others. The enemy! I would say that at this time I am an independent conservative. I have attended many Tea Party Rallies and I feel that the Tea Party Movement is filled with people that I most agree with. Wow. There is so very much that I want to say here. I'll save that for another day. Last night I attended a local candidates night for the position of Supervisor. I have learned that the local government is so much more important than I ever realized. The supervisor has huge responsibility and can vote for things that will directly affect my life. So, this candidates night was important to me. I didn't know anything about anyone who was running. It became clear to me early on that I had a favorite. They invited us to ask questions by writing them down on a card and I was eagerly waiting for them to read my question. The guy that I was leaning toward answered my question in a way that was satisfactory to me. The next guy made fun of my question. He laughed and made my question in to a joke. I was furious. He made it seem as though my concerns were invalid and so far "out there" as to be "crazy". Which means that he was insinuating that I am crazy. Being the crazy person that I am, I visited this person's campaign website and found a wealth of evidence that supports the very issue I was asking about. Turns out HE is crazy. Crazy like a fox. He knew just what I was asking about. He is a supporter of it. I guess he would rather keep it as a secret and was not too happy that I brought it up. I'm going again tonight. I'm asking again tonight. Will he laugh at me again? What happened to civility? I believe that we can disagree. I don't agree with him. In fact, I am convinced at this point that he is an evil man bent on taking away the freedoms that define our country. But, I don't intend to ridicule him or belittle him at the meeting. I would much rather have a discussion where all voices are heard. I support his right to his opinion. But, he would seek to silence mine. I have avoided politics at Lulu's Cottage. This is weighing heavily on my mind. I would urge everyone to return to civility. Let everyone speak and let the chips fall where they may. Why would anyone want to win anything by denigrating the opposition? Win because you have the better idea and because you inspire people. Not by being a bully. I just realized that today is May Day. 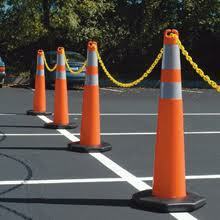 I have the sudden urge to find a pole and decorate it with ribbon! 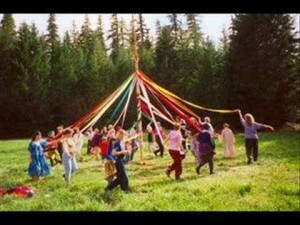 I remember when I was a little girl, we always celebrated May Day with a May Pole Dance. Do they do that anymore? Beautiful ribbons would be attached to the top of a pole (usually the tether ball pole) and each of us would hold a ribbon and dance back and forth as we skipped around. The ribbons would weave together and get shorter and shorter. I remember that I thought it was pretty and fun. The boys didn't seem to care for it much tho. Now that my kids are grown up, I am out of touch with what kids do these days. It seems to me that little by little, so many traditions are disappearing. 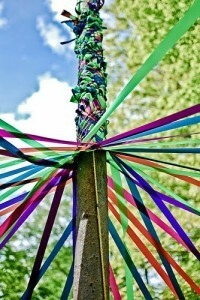 I hope that they still have the children do the May Pole Dance! 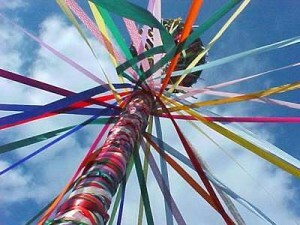 Happy May Day to you! Spring is here. The sun is out. The birds are singing. I'm off to find some ribbon!! Yesterday I went to Walmart and as though I was on autopilot, I went to the side of the store where I ALWAYS park my car. Shock. It was blocked off with shopping carts. No cars allowed. I had a moment of "what do I do now"? Of course this is just a small side parking lot. The entire parking lot was open. As I was trying to figure out what to do next, someone pulled out of a space right in front of me. Whew. Problem solved. When I came out of the store, I walked directly to the side parking lot (still closed). What? I had to think for a minute to remember where my car was. I'm a creature of habit. I always go to the same grocery store. I like that I know where everything is. I like that the clerks know me and we get to visit when I check out. There is just something comforting in familiarity. Since I moved my blog. I have felt lost. To anyone who may be following my blog, it probably looks pretty much the same as it always did. But, for me, it's very different. The entire log in process is different. 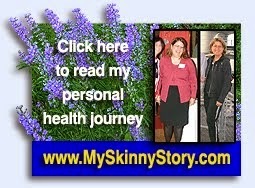 The way I enter a blog post...different. It just feels different. And, because of that, I have not even attempted to post anything. I changed for some really good reasons. I was spread out in several different directions and I wanted to have everything in one place. And, now, I DO! It's all on www.stephcentral.com. Yes, this is what I wanted. But, now that I have it, I'm lost. Eventually, this will become my new normal. I vow to write something ANYTHING everyday until it becomes natural and easy. And, I have been too busy for decorating and crafting....but I have been working on a few fun projects that I hope to finish and post in the next few days, so check back!